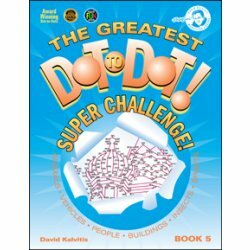 Family Review Center announced today that The Greatest Dot to Dot Series has been awarded the Gold Award! PHOENIX - April 3, 2013 - PRLog -- Family Review Center announced today that The Greatest Dot to Dot Series has been awarded the Gold Award! The Gold Award is awarded to companies whose products go above and beyond what one would expect from the product. This may be in functionality, practicality, look, pricing or quality. It is sometimes all of the above. However, the panel of judges at Family Review Center [familyreviewcenter.com] are very stringent on their requirements and know a good product when they see it. The Greatest Dot to Dot met those guidelines and came out a winning champion! For this, we bring notable mention to them as a product that deserves recognition and careful consideration. The Greatest Dot to Dot Series has proven to be a very well designed product that offers a challenging puzzle objective that is not found elsewhere and in fact is the only patent pending dot to dot in the world. It’s unique flair won it favor at the table of judges. It was also found to be offered at a good price. Another winning factor at the judge’s table. Family Review Center has been serving businesses and families with free product reviews and a prestigious Awards Program since 2000. Being highly regarded as a leader in the review world, they appreciate and enjoy the opportunity of bringing great products such as this one, to the attention of their audience. Family Review Center is currently accepting product submissions for the next Award Cycle. All Review Product Submissions are Free. All reviews are unbiased. At Family Review Center there are no negative reviews. If a product does not merit a favorable review, it is not posted. The Greatest Dot to Dot Series can be found at Monkeying Around! [monkeyingaround.com] and the review can be viewed by visiting Family Review Center - clicking on the Reviews Tab at the top and entering #2864 in the query box.